The medicinal and aromatic plants (MAPs) sector is a complex and fascinating beast, also beset by huge challenges. It is not easy to source sustainable and high-quality botanical ingredients in a world that is experiencing rapid development, urbanisation and land-use change, alongside the increasing use of pesticides and chemical pollutants. China is a major player in the global trade of MAPs - both as a source country, but also as an importer, processor and exporter of ingredients. It is the world's leading exporter, accounting for over 15% of global exports per year, a high proportion of which are sourced from the wild. Although many species used in herbal medicine, foods, cosmetics and other applications are now being brought into cultivation, this is not viable for all - either due to economic factors, or because the biochemical properties of the species change when grown under cultivation. Therefore, we can expect to continue to be reliant on wild resources for many of our needs, for a long time to come. This is not necessarily a bad thing. Wild harvest has traditionally provided an income to some of the poorest and most marginalised members of society, who may lack access to land for farming and other livelihood opportunities. The traditional use of wild plant resources has a long history, and is an important aspect of human culture. With the right conditions in place, wild harvesting can also contribute to conservation - both through sustainable use of the target species, and also of their wider habitat, by providing incentives for land management and preventing conversion to other, less biodiversity-friendly land uses. Beijing, China, 25th October 2017—Today marked a special day as a signing ceremony was held between the FairWild Foundation and the China Standard Conformity Assessment Co., Ltd (CSCA)., marking the accreditation of CSCA as the exclusive certifier for FairWild in the People's Republic of China. The FairWild Standard (www.fairwild.org) provides guidance on how to harvest and trade wild plant ingredients sustainably and equitably. The Principles and Criteria cover ecological, social and economic aspects of sustainable use and trade, providing a comprehensive framework for the verification of sustainable wild collection practices. Companies implementing the FairWild Standard put in place the building blocks of a resource management system, including species-area management planning, training of collectors on sustainable harvest techniques, and payment of fair prices, as well as a development Premium for social projects prioritised by the collectors. The FairWild Standard is used as the basis of a third-party audited certification scheme, and has also been used in other ways, for example, in the development of company codes of practice on sustainable sourcing. Since 2008, the FairWild Foundation has been working with partners to pilot use of the FairWild Standard in China. A precursor version (ISSC-MAP) was used to guide activities under the project “Sustainable Management of Traditional Medicinal Plants in High-biodiversity Landscapes of Upper Yangtze Ecoregion”, implemented by TRAFFIC, WWF, IUCN and other partners between 2007-2011. Funded through the European Union-China Biodiversity Programme (ECBP), this initiative in Sichuan, Gansu and Shaanxi Provinces aimed to introduce local producers to the skills needed for sustainable harvesting of wild Traditional Chinese Medicinal plants, including facilitating trade links to international markets. Techniques for sustainable collection of species such as Southern Schisandra (Schisandra sphenanthera) were developed, contributing to sustainable livelihoods in biodiverse landscapes such as habitat of the Giant Panda (Ailuropoda melanoleuca). A second project aimed to build on this experience from a different angle, by introducing corporate social responsibility (CSR) and sustainable sourcing principles in the TCM industry. The FairWild Standard was used as a sustainability framework for the project “Engaging China's private sector in sustainable management of medicinal plants (EGP-MAPs)”, which included piloting of sustainable supply chain partnerships by the participating TCM companies, and the development of CSR principles to guide the industry. The project was funded by the European Union-China Environmental Governance Programme (EGP-MAPs), and implemented by TRAFFIC and partners between 2013-2015. The availability of FairWild certification audits in China has long been an ambition of the FairWild Foundation, as well as many other partners and stakeholders involved with the trade in wild medicinal and aromatic plants. Certification involves third-party assessment by a qualified control body, including an annual on-site audit by a trained inspector. The certified ingredients can then be traded under the FairWild label, allowing communication of sustainable sourcing practices to the public. There is a large potential market for FairWild-certified ingredients from China, as highlighted in the recent TRAFFIC-ITC publication “Sustainable Sourcing: Markets for Certified Chinese Medicinal and Aromatic Plants”. The review identified the scale of the existing trade, as well as the opportunity for China's medicinal plants production sector to benefit from the growing consumer and industry demand for certified sustainable, fairly traded products. However, until recently, the FairWild certification scheme has not been available in China; the necessary partnerships and permissions from government agencies having not yet been in place. 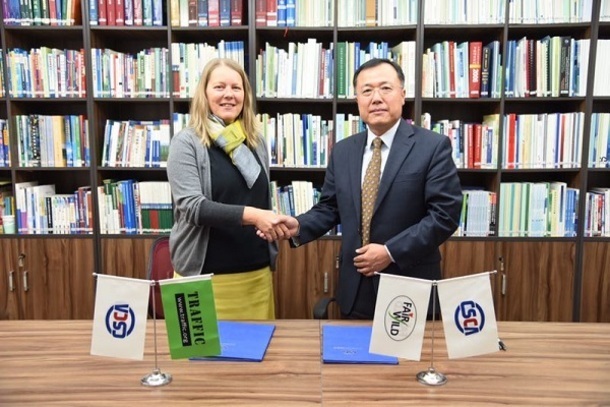 In 2016, FairWild Foundation signed an MoU with the certification body China Standard Conformity Assessment Co., Ltd (CSCA), with the aim to work on a joint road map for the introduction of the FairWild certification scheme in China. In October 2017, this ambition was realised - auditor training was successfully carried out for CSCA's staff, and CSCA's accreditation process as a FairWild control body finalised. This opens the opportunity for FairWild certification of Chinese wild plant ingredients , something we hope the industry will be keen to take advantage of. Although things are changing slowly, there is a big opportunity for sustainable sourcing to take root in the herbal products industry. Around the world, there is a persistent trend in consumer demand for safe and sustainable products, as evidenced in the growth of the organic and fair-trade sectors, which are resilient even in the face of financial crisis and recession. China is now starting to participate more fully in the global sustainability certification sector, with a policy to accommodate and make use of international standards. We hope this development is the start of a new green growth for the TCM industry! FairWild Foundation would like to thank NuHerbs as a “Friend of FairWild” for supporting our work on increasing the sustainability of the wild plants trade, including the introduction of the FairWild Standard and certification scheme in China.